Situated in the prestigious north-eastern quarter of the Walled City, in the very shade of Mehrangarh’s Victory Palace and Gate, and a stone’s throw from the Clock Tower; RAAS comprised, in fact, of four charismatic buildings in Jodhpur’s very own ‘rose-red’ sandstone. The oldest, the Haveli proper as it were, was built towards the end of the 18th Century and with its delicately carved stone panels – the hall-mark of Rajput Architecture – served as the exclusive and intimate residence of the family. The newest, the Baradari, a multi-pillared, multi-purpose open Pavilion built probably in the 1850s, was really the centre of activity; it was where the Thakur spent his days, and no doubt many a night, entertaining and being entertained. An impressive entrance Pol with its staff quarters and guard-house; the Dari-Khana – literally the Chamber of Carpets, which served as a Guest-House; a small Temple; and, of course, the Stables, complete the complex. Jodhpur’s first boutique hotel comprises three new buildings in addition to the original four; a rare and charming complex that reflects in many ways the Walled City itself. Indeed, with its sensational vistas, different styles and angles, a central water body, square and garden; and an all pervasive warm “organic feel” RAAS is a microcosm of the city. 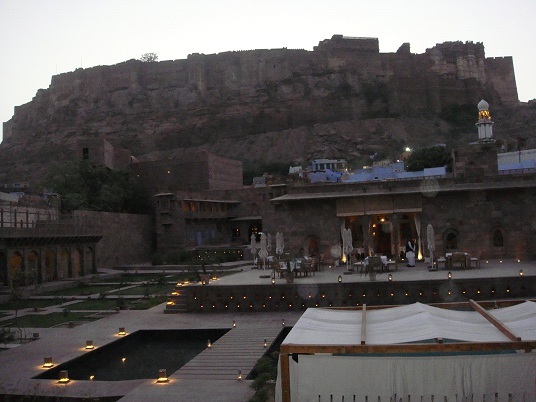 And…like virtually every home here, almost every room in the hotel enjoys the most spectacular view of Mehrangarh, rated in 2008 by Time Magazine as “Asia’s Best Fortress”. The new buildings are modern and contemporary in their use of space and light and context; and yet grounded in tradition. Jodhpur’s red sand-stone unites the new with the old, even as modern designs and patterns in its dressing and carving add an exciting and fresh dimension to the region’s age-old stone carving industry. This seamless harmony between the old and the new, the modern and the traditional, the familiar and the surprising…extends to all aspects of RAAS; and it is everywhere, and at all times, as comforting as it is inspirational. Accommodation comprises 39 rooms, 7 of which are suites with separate sitting rooms, larger balconies and bathrooms. 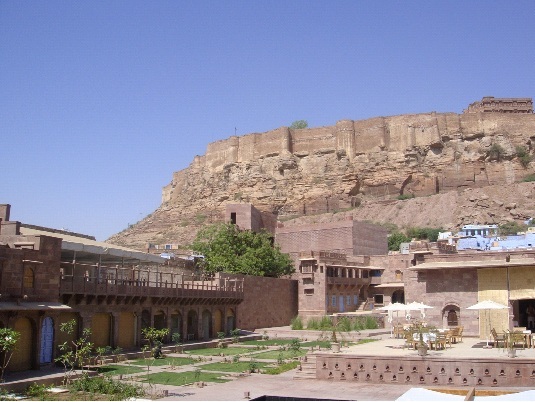 35 rooms have views of the Mehrangarh Fort and the remaining 4 rooms have private gardens overlooking the old, restored buildings. All rooms and suites have balconies and are decorated with great flair and care. They are contemporary, understated and make the most of Jodhpur’s pink sandstone, stunning black terrazzo and with splashes of ‘Jodhpur blue’. They are state of the art and furnished to an exceptionally high degree of modern comfort and sophistication. Light, space and clean lines are the bywords here. All the rooms are air-conditioned (centrally heated in the winter) and are fitted with the latest eco friendly machines, overhead fans, hairdryers, electronic safes, TV and telephones. All rooms come with modern attached bathrooms which have separate showers and cast iron bath tubs. Bathrobes are placed in all bathrooms. Plenty of piping hot water is provided by central and solar water heating systems. Hot water bottles can be provided on particularly cold nights. Dining: There are two restaurants, a covered dining room and al fresco, namely the Darikhana Restaurant and Baradari Café by the pool. There are both table d’hote and a la carte menus available, serving continental and Indian food. Room service is available too. All rates are inclusive of bed and breakfast. There are no set meal times. Other Facilities: A 15 x 8 m swimming pool • E-mail facilities for hotel residents • Wireless connectivity • Hotel shop • ‘Jodhpur blue’ Tuk Tuks for sightseeing • Spa managed by Serena Spas.